Description: This is a grocery story cash register that is a step above all cash registers. This register has a built-in conveyor belt that vibrates, a scanner that beeps, scales that beep, and kids hear random prices, weighs, grocery names, and more! The reigster has a 12 button number pad, number 1-9, plus an addition and subtraction sign, and a large red button that opens the cash drawer. 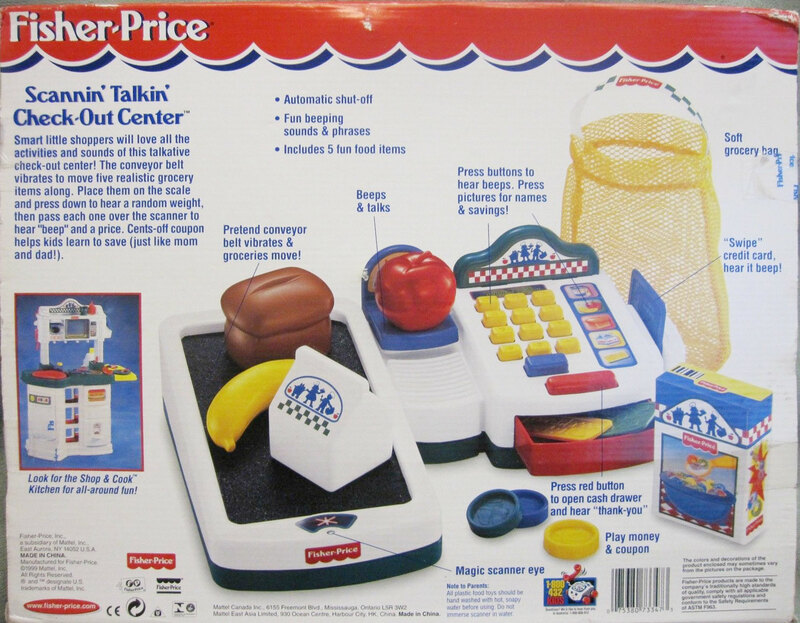 It even has a credit card scanner on the side, just like real grocery store registers. 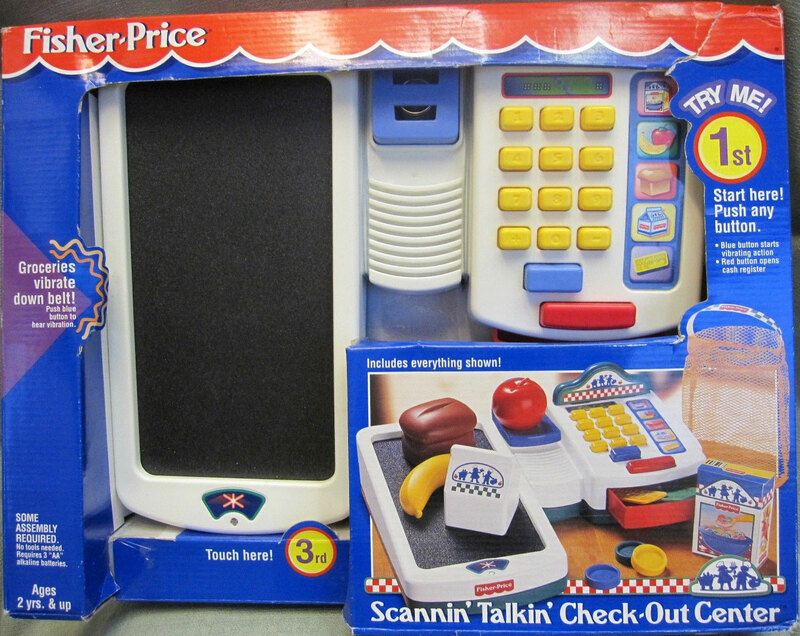 FPT13969 - Battery operated, motorized supermarket checkout that scans, talks, beeps, and vibrates! It has a white top, green base, and a black working conveyor belt that has an electric scanner on the end that beeps when groceries pass through. There is a blue produce weigh scale beside the conveyor belt, and a cash register beside the scale. The register has yellow keys (0-9, and +, - signs), a red cash drawer, a red push button on the register that makes the cash drawer spring open, and a credit card scanner on the side. The top of the register has a green edge with a litho of a red and white checkered bar across the bottom and a blue outline of a boy and girl wearing chef hats. FPT13970 - Small light brown rectangular loaf of bread. The top of the bread loaf is mushroomed (larger than the base and rounded on top). The top of the loaf has a long split. All of the edges and corners of the bread loaf are rounded. FPT14476 - Long yellow whole bananna with a molded top and end piece. FPT44280 - Red plastic apple with a molded plastic stem on top. Apple has a flat bottom and marked, "CHINA". FPT13971 - Small square white milk container that container looks like a public school milk carton. The top sides are triangular with a point in the top center. The top front of the milk carton has a blue oblong odd-shaped circle with a blue shadow print in the center of the circle of a shopping cart, and a girl and boy chef wearing chef hats. The bottom 2 corners of the circle have red apples. There is a green and white checkerboard below the blue circle. *See "Variations" below for milk carton without the printed designs on the side. FPT13972 - Tall rectangular cardboard box of cereal with a picture on the side of a blue bowl with cereal and milk. The cereal looks like Fruit Loops. A yellow spoon is above the bowl with a spoon full of milk and cereal. The top of the box has a red and white checkered design with a blue bar across the top. There is a blue triangle between the checkered pattern and blue bar that has a blue shadow print in the center of a shopping cart, and a girl and boy chef wearing chef hats. The bottom 2 corners of the triangle have red apples. FPT13973 - Small blue rectangular hard plastic credit card with an imprint on the side of a child's portrait, a Fisher-Price awning logo imprint, lots of indented lines, and numbers across the bottom. All 4 corners of the credit card are rounded. FPT44222 - Small yellow rectangular hard plastic credit card with an imprint on the side of a child's portrait, a Fisher-Price awning logo imprint, lots of indented lines, and numbers across the bottom. All 4 corners of the credit card are rounded. FPT14459 - Green hard plastic rectangular dollar bills with rounded corners. FPT13977 - Round blue plastic coin marked "10" on one side. The edges of the coin are smooth (NOT ribbed). Coin has 2 holes. Marked, "©97 FP INC., CHINA". FPT13978 - Round green plastic coin marked "25" on one side. The edges of the coin are smooth (NOT ribbed). Coin has 2 holes. Marked, "©97 FP INC., CHINA". FPT13976 - Round yellow plastic coin marked "5" on one side. The edges of the coin are smooth (NOT ribbed). Coin has 2 holes. Marked, "©97 FP INC., CHINA". FPT13979 - Yellow net grocery bag with a green and white checkered carry handle on top. FPT14698 - The white plastic milk carton is available without printed designs on the top and sides. The bottom of the carton has a small "© F-P.INC. CHINA" imprint. Also see 1988-1990's #2102 Magic Scan Checkout Counter. Also see 1991-1992's #2157 Magic Scan Checkout Counter.